The North and South American subsidiaries of Maccaferri are joining together for GeoAmericas 2016. This year’s event is the 3rd Pan-American Regional Conference on Geosynthetics. Held every four years, the previous editions of GeoAmericas took place in Cancún in 2008 and Lima, Peru in 2012. The 2016 event will be held in Miami Beach, Florida, April 10-13, 2016. GeoAmericas is hosted by the North American Geosynthetics Society (NAGS), an organization in which individual and student members comprise the learned society whose mission is to support the development of geosynthetic technologies and engineering through education, communication and networking. Maccaferri Latin America, Canada, Mexico and the US will be sponsoring and exhibiting at this event. Representatives from each company, as well as VIPs from the corporate office in Italy, will be on hand to meet and greet the attendees. Multiple papers will be presented by Maccaferri staff and the author/presenters will be at the booth (#201) to discuss the topics. This is an opportunity to meet a large diverse group of Maccaferri people and to learn from their different perspectives on Geosynthetics in the Western Hemisphere including political, economic and importing/exporting issues. We look forward to meeting everyone. 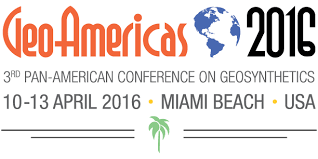 To learn more about our contribution at GeoAmericas 2016, please feel free to contact us.